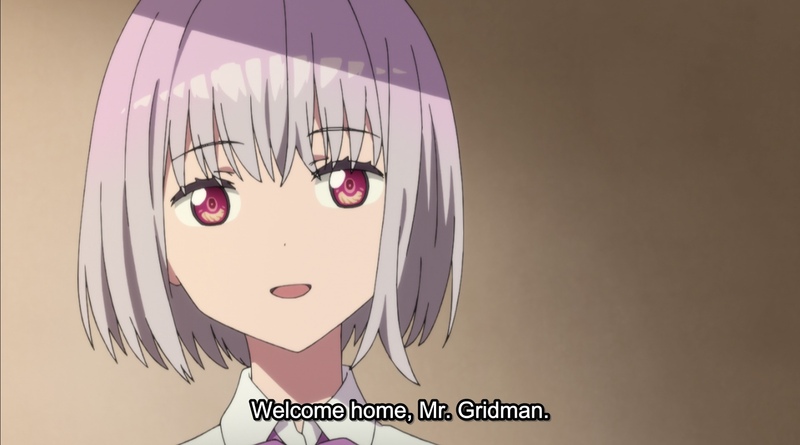 It’s an SSSS.Gridman two-fer review! Need to catch up? Check out my previous review here! After returning from their field trip, Yuta suspects Akane’s memories aren’t resetting. Sensing Yuta’s suspicions of her, Akane asks Anti to kill Yuta. Anti doesn’t get far though as he bumps into Rikka, who treats the kaiju to some food and a bath. Meanwhile, Yuta runs into a new kaiju who promises to tell him everything he needs to know. The kaiju – a young girl – reveals that Akane is the one creating the kaiju. All of the victims of the kaiju attack are people Akane didn’t like. Akane very literally has a god complex, and is being manipulated by outside forces. While that’s happening Sho and Akane talk kaiju manga. Their conversation quickly shifts to Yuta, and Akane begins to interrogate Sho about what Yuta may be hiding. Although he appears to be acting out of a need to protect Akane, Sho doesn’t spill the beans about Yuta’s secret. While it seems like the trio were dealing with these issues privately, they were secretly being followed. The Neon Genesis Junior High students have been stalking all three throughout the day. This ends up being good news for Yuta, as Max and Calibur are able to protect Yuta from a surprise attack from Anti. Anti, believing Yuta is actually Gridman, is eventually convinced that Yuta is a human. Yuta wastes no time in telling Rikka and Sho about Akane’s god status. When Rikka mentions that high school girls don’t even like kaiju, Sho stays quiet about his conversation with Akane. Later on when telling the story to the Neon Genesis Junior High students, Max backs up Yuta’s story. He leaves Rikka’s shop determined to ask Akane about being a god tomorrow, only to find her in his house! Akane propositions Yuta to join forces with her. Yuta obviously declines, causing Akane to switch tactics and ask him out to dinner. They end up at the restaurant of one of the girls Akane killed with her kaiju. When Yuta asks her why she did it, Akane admits that it was because the girl squished the bread she planned on giving to Yuta. Their heated conversation is interrupted by Alexis’s arrival. As Alexis begins to explain his hand in the kaiju creation process their meal is interrupted once more, this time by Yuta’s bracelet. Yuta rushes outside just in time to see an alien spaceship fly by. Sensing Gridman is needed, Yuta rushes back to the shop to join forces with the robot.. Meanwhile, Akane heads home to confront Alexis about the UFO. Alexis tells Akane that the UFO is actually a kaiju that Anti designed. When Akane asks why Alexis allowed Anti to create a kaiju he tells her that Anti hates Gridman more than she does. Back in the city the fight is not looking good for Gridman. The kaiju has the ability to restore itself, rendering Gridman’s attacks useless. Sensing that Gridman needs more aerial support, Vit joins the fight in his jet form. With the power of flight the two quickly defeat the kaiju. During the battle, Gridman and Vit fly high up in the sky, only to see a duplicate city floating above their own. The battle may be over, but the mystery surrounding their city and the kaiju has just begun! These latest episodes of SSSS.Gridman are incredible. The creators have really begun to explore the mysteries surrounding Yuta and his city, which is something I’ve been waiting for. Given what we currently know, there’s a lot of room for speculation about the duplicate city and Akane’s powers. Is the world Yuta lives in the original or the copy? Does his memory loss have something to do with Akane’s powers? Speaking of Yuta’s amnesia, I wish it would just be addressed. It’s constantly mentioned in an offhand manner, almost like an afterthought. This is a plot point that desperately needs exploring, and I’m hopeful the remaining episodes do that. The animation is always one of the best parts of the show. I really enjoy that we’re seeing Gridman interact with the Neon Genesis students more. Their combinations and attacks make the fights a lot more enjoyable to watch. Despite more inclusion on the battlefield, the Neon Genesis students still seem to be outsiders in the Gridman gang. Overall, they’re still such flat characters. We are seeing Max connect more with Yuta, but the rest of the students barely interact with anyone.